Since its successful launch in April 2016, South Warwickshire & North Cotswolds NOW has established itself as the leading free magazine in the South Warwickshire & North Cotswolds area. 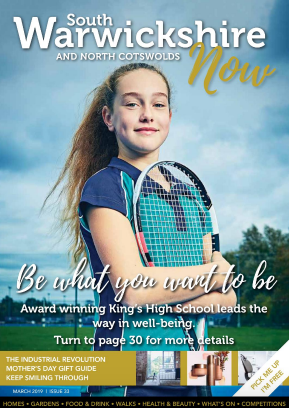 Printing 15,500 copies each month the magazine is hand delivered through the letterboxes of middle-class homes in Leamington Spa, Warwick, Henley – in – Arden, Studley, Alcester, Bidford – on – Avon, Kenilworth, Southam, Stratford- upon – Avon, Evesham, Broadway, Shipston- on - Stour and Moreton – in - Marsh. The South Warwickshire & North Cotswolds NOW is also delivered to various hotels, pubs, restaurants, garden centres, train stations, leisure centres, council offices and libraries across the county. With our popular competitions and regular features such as: Homes & Gardens, Eating Out, Health & Beauty, Walks, What's On & Theatres' there's – something to read for ALL the family!